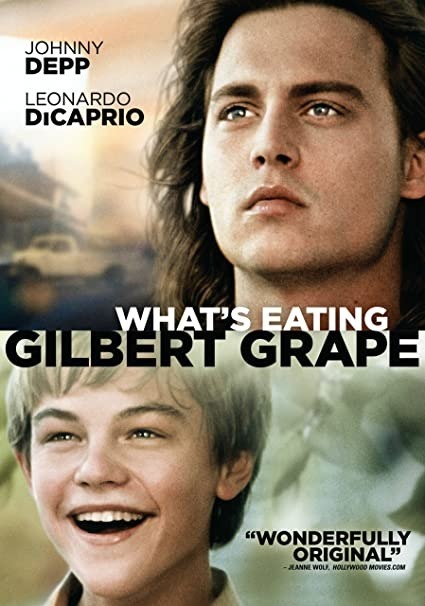 In the small town of Endora, Iowa, Gilbert Grape (Johnny Depp) is busy caring for Arnie (Leonardo DiCaprio), his brother with a developmental disability, as they wait for the many tourists' trailers to pass through town during an annual Airstreamer's Club gathering at a nearby recreational area. His mother, Bonnie (Darlene Cates), gave up on life after her husband hanged himself in the basement 14 years earlier. She spends almost all of her time on the couch watching TV and eating. With Bonnie unable to care for her children on her own due to her morbid obesity, Gilbert has taken responsibility for repairing the old house and looking after Arnie, who has a habit of climbing the town water tower, while his sisters Amy (Laura Harrington) and Ellen (Mary Kate Schellhardt) do the rest. The relationship between the brothers is of both care and protection, as Gilbert continually enforces the "nobody touches Arnie" policy. A new FoodLand supermarket has opened, threatening the small Lamson's Grocery where Gilbert works. In addition, Gilbert is having an affair with a married woman, Betty Carver (Mary Steenburgen). Read more on Wikipedia.